When he allowed a cricketing misdemeanour under his watch and was banned for a year, Steve Smith put Australian cricket on the back foot. He also paused an individual career that was—and still is—the third-best in terms of average runs scored per innings in Test cricket. In his year of absence, Australia will play nine Tests. Had he played them, the former Australian captain, instead of being an asterisk, would have been even closer in Tests played to Virat Kohli, Joe Root and Kane Williamson—the other three members who make up the batting quartet of our times. The closeness and symmetry in the numbers of those four batsmen in Test matches is striking. They are separated by only about two years, aged 28 years to 30 years—roughly the mid-point for batsmen who compiled long and prolific careers. They are also separated by 11 Tests and 693 career runs—roughly the equivalent of one year’s work. All four are currently in or around the 6,000-run bracket, averaging above 50 runs per innings. They are pivots of their side’s batting. All four are impact players: their batting average increases between 5 runs (Kohli) and 21 runs (Williamson and Smith) in victories. All four are significantly better at home than away, with a differential in average between 9 (Williamson) and 24 (Smith). All four are captains (Smith was and could still be). They lead the current conversation for a place among the batting pantheons. Given their current alchemy of age, talent, skill and record, these four will be watched—together—to see if they can match, even better, the run machines from the generation that preceded them. For all their current similarities, the four started differently. Root and Smith were quicker off the blocks. Root breached the 50-mark in innings average in match 22. Smith did so in match 25 and has bettered it since. By comparison, Williamson and Kohli blossomed late, taking 50 Tests and 52 Tests to pass that point with some level of stickiness. Lately, Smith apart, the averages of the four appear to be converging in the 50-55 range (chart 1). Can they challenge the Mount Everest of cricket records: 15,921 Test runs, held by Sachin Tendulkar, who played into his 40th year? The last batsman with a serious shot at it was Alastair Cook, Root’s predecessor. However, earlier this year, at the relatively young batsman age of 33 and despite being about 1,800 runs ahead of Tendulkar at the same age, Cook opted out, done in by the relentless demands and scrutiny of first captaincy—something this quartet also faces—and then top-flight cricket. Among this quartet, the one with the maximum runs is Kohli. Though he’s in a phase where he is finding a new centre in his Test batting, he’s nearly 3,000 runs behind where Tendulkar was at the same age. That’s some catching up to do, though Tendulkar fell off after age 29, averaging 645 runs a year till his retirement, compared with 904 runs in his seven years before that. 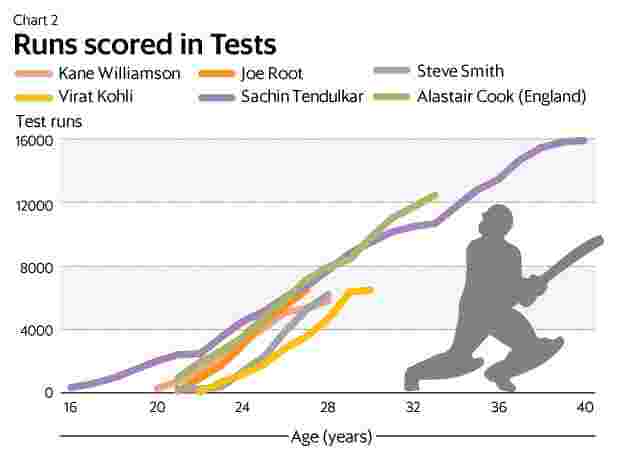 Root, who is nearly two years younger to Kohli, has more runs than the other three at his current age and is also only 212 behind Tendulkar at the same age (chart 2). However, Tendulkar’s record is a long way away. This quartet will have to operate at their current levels for another three to five years before they even start to be written as finished goods in the same sentence as a Tendulkar, or even a Ricky Ponting, Jacques Kallis, Rahul Dravid or Kumar Sangakkara. For all their symmetry, there are several differences in the way they have gone about their game or the contexts they have stepped into. 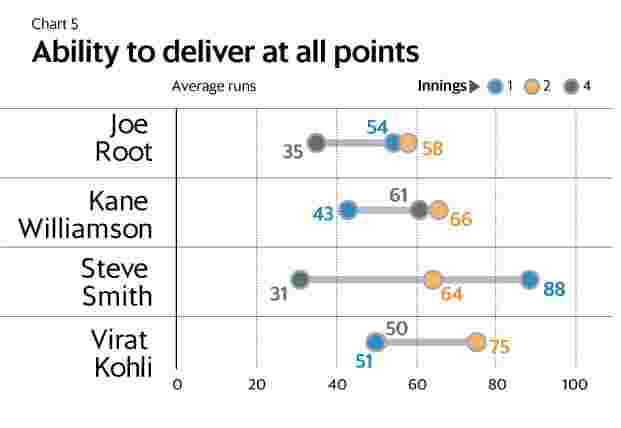 Root apart, the other three average more as captain than they did as a player. 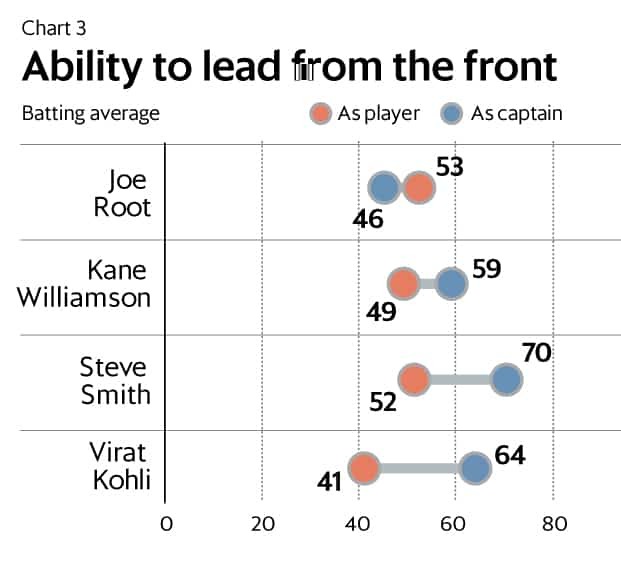 Compared with 52 as a player, Smith averages 70 as a captain, the most among the quartet (chart 3). That statistic makes for better reading, given Australia’s shifty and fragile batting lineup for a good part of his tenure. 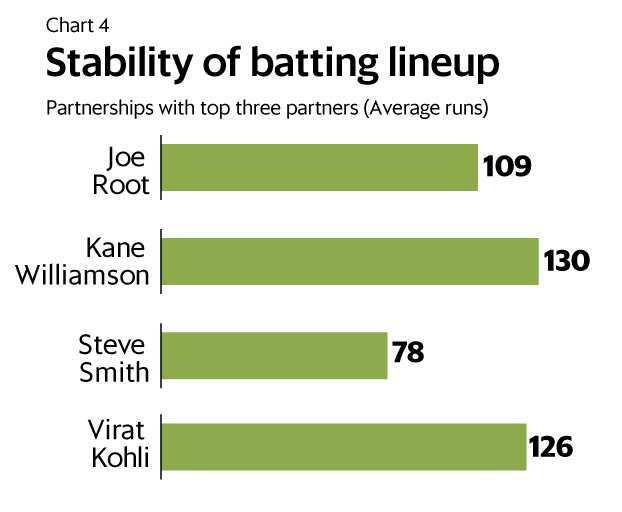 As a result, Smith’s partnerships are more spread out than the others: his partnerships with his top three partners add up to 78, a far cry from the 126 of Kohli and 130 of Williamson (chart 4). 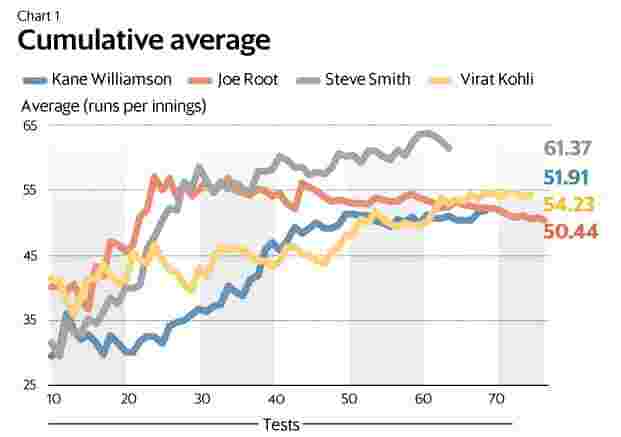 If batting first in a match is when Smith is most effective (average of 88), that place for Kohli is batting second (average of 75) (chart 5). But both slip, especially Smith, when it comes to batting fourth. The fourth-innings master is Williamson, averaging a staggering 61. Of the batsmen to have played above 15 innings in the fourth innings, Williamson’s average is next only to Don Bradman’s. If these four go on, records will be rewritten.